Doubtful and rejected items of tesselated paving are listed here rather than in the Doubtful and Negative sections; they are not shown on the distribution map. © Copyright John Palmer. This is work in progress, last updated 2019-04-12. Please use this link to send me comments and suggestions. grid SY 99 78 approx. desc Observations in 1975 (Farrar): tess. of red tile about 1yd sq. In 1977 (Keen): red tess. floor mostly destroyed by ploughing. Room 111 had a mosaic floor, with a black (shale) and white (chalk) geom. design. In 1981 (Field): tess. floor in poor condition. In 1982 (Collins): most of tess. floor of veranda had vanished. There were 4 central rooms (26-29) later combined and given a common tess. floor. grid SY 96 87 approx. desc Room 1: stripes of red and grey tesserae 25mm square; grey is stone, red ceramic. This was the mosaic found by Hogg in 1880. Room 2: (similar) red and grey tesserae. Room 3: Grey tesserae 2cm square. subst non-Purbeck, by petrological report. Margaret Morris, Geol. Surv., in Farrar p.99: Red: brick. Black (and brown): fine grained clay rock with some dolomitic content [possibly] from hardened marls of the Lias formation. Brown: Oolitic limestone, prob. Portland Limestone. Yellow: dolomitic limestone poss. Jurassic. Blue and White: chalk (the chalk varies from cream to white to pale bluish grey). desc Floors in fragmentary condition. grid SY 689 906 approx. date Bellamy p.52: 3rd cent. desc Pavement found at Dorchester Castle `while digging a grave for an executed criminal' and relaid in the castle. Information from the governor JV Lawrance, whose account is reported also in Hutchins 3rd ed 2 394-6.
loc DCM, arch. coll. F1 misc; main part on first landing of main staircase behind an oil painting; smaller part (guilloche) in `conservation' display (cases 3,4,5). Before 1885 in Prison. Some guilloche may be lost, left at Prison (says Ashford). desc RCHM: small part of a tess. pavement interspersed irregularly with red tess. desc PDNHAS: tess. 1in sq. but irregular, of light grey limestone irregularly interspersed with red tiles of up to 1 1/2in sq. desc red, buff/yellow, offwhite, black tess. about 10mm. desc Moule: substance doubtful (black, buff), NOI (red, offwhite). RCHM: `the grey is mostly PM' which JP finds surprising but the greenish- black could be so; the offwhite ones also? desc 14ft by 8ft, 1/2in sq. tess., black, red, blue, white, light brown, outer border of coarser white tess. date Woodward: from style, 4th cent. desc floor about 12yd sq; design elaborate with vases, serpents, leaves etc. Tesserae small: red, blue, white, yellow. subst JP can't find shelly limestone on inspection. Note that RCHM says black is limestone! desc 1971: Room 11, apsidal alcove: pavement in red, black, white, brown, grey (grey for dolphins' backs). Most of rest of paving in room 11 destroyed; but the leopard leaping on gazelle (illus. in Russell 2019) is from this room. Room 12: Corridor mosaic, greek key in white, black, dark red with borders of coarse grey and brown tess. date 1881: 4th cent. 1902: 200AD? desc 1817: dies of hard bluish granite stone, bricks, red and black, and white pebble. 1830: a length of guilloche in tesserae of black, white, red, yellow, dark blue or bluish-black, grey. desc `2 notable tesselated pavements. (1) 13ft square ... a series of concentric bands ... in a round panel at the centre ... a vigorous and perfect head apparently of Jupiter Tonans, with 6 forks of lightning issuing from the curl-enriched head ... mosaic is of black, white, red, grey and pale blue limestone (JP's emphasis) ... [May represent] Sun God. desc B Chubb writing 1999: 40 years ago during road widening a mosaic was broken up and the bits taken to Warmwell tip. Building destroyed behind the butcher's shop in which under 9in of concrete was a black and white mosaic; tess. small and regular, similar to border of Lott and Walnes mosaic. Nothing left of this building now. grid SY 69 71 approx. site Sherborne Abbey, 19th cent. grid ST 63 16 approx. desc Mosaic and mosaic replica. Replica copied from a Roman pavement in London, Queen Victoria St.
desc Tanner and Giles: building 1 room 1, plain tess. with a small random pattern at one end of red, white and black. Tess. on plain floor 1in sq. and made of Purbeck stone; the coloured were of boxflue tile. Corridor (room 1.7), 38ft by 7ft6in, white tess. with a central panel of red and white forming a zigzag pattern. desc Graham: quotes Tanner and Giles above, p.55, p.58. 1968-70 finds (presumably): Fragments transferred to Priest's House Museum, Wimborne, 1994; ?laid in courtyard, as in photo in Ashford? desc Beavis: `white and bluish-white tesserae and Portland Stone', bluish-white could be PM. desc Osmond Fisher in Stuart 1888: the white tesserae are PL. There are tess. red (tile), brown and white. desc A fragment of tess. pavement discovered 1857 during renovations, near base of a pier of the nave; 12in by 8in max. of red and light grey (Mayo's white) tess. about 1 1/4in sq. 9in below present floor. desc Boon 1957: `5ft sq panel of coarse mosaic ... containing a bold chequer pattern of black and white, surrounded by 7 lozenges on each side, alternately of red and grey-green Purbeck cubes'. Pl.9 is photograph of mosaic in situ. desc Boon 1974: Pavement `design of black and white chequers on a quarterly countercharged background of the same, within a border of red and grey-green Purbeck lozenges on white'. Pl.27 p.202 shows the mosaic in situ. Average size of tessserae is the usual 1/2in square, but in much of the work it is much smaller. Hope and Fox go on to date the pavement early on stylistic grounds. It contains a remarkable area with a vine pattern identified as Smilax aspera in monochrome. The first may refer to the "church" but the latter probably to Hope and Fox cited here. desc Allen and Fulford identify Hope and Fox's mosaic above as Mosaic 2 from House 2 in Reading Museum. They are unable to confirm that the grey-green is PM. They state on geological grounds that the black(?) is Kimmeridge cementstone. desc Sample of 1309 whole or partial tesserae recovered from Silchester Insula IX excavations 1997--2003. Grouped into lithological classes of which the most common (`La') is carbonaceous, yellow-grey to yellow-black. Identified from the dolomites in it as cementstone from the Kimmeridge formation of Dorset, such as outcrops in bands at Kimmeridge Bay. Further conclusion that the mudstone tesserae and opus sectile from Norden are not from the Purbeck formation, but Kimmeridge cementstone also. 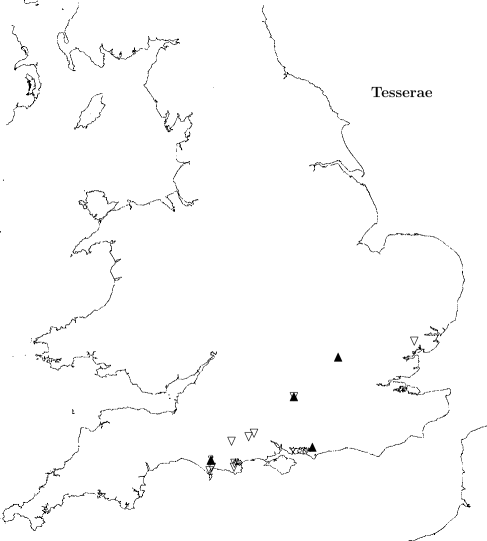 Discussion of the distribution of this stone in southern England which is not irrelevant to the distribution of Purbeck stone as well. comment This note to be added to! desc `small marble tesserae found by the Ashford Archaeological Society' is all Scott has to tell. 1. White chalk: soft, used sparingly. 2. Cream colour: Limestone band, middle of Gt Oolite, of which 4ft is exposed at Trensbury quarry. (Lysons says these are Polombino from Italy; Buckman/Newmarch disagree, after examining it chemically and geologically.) . 3. Grey (and light olive): same lithology as the cream, evident on breaking them. 4. Yellow: principally from local gravel. Some which are brighter than the rest are local Sarsen stone. Many of the oolite beds furnish stones which turn yellowish on exposure from oxidisation of contained iron. 5. Chocolate: Old Red Sandstone, nearest source Herefordshire. 6. Slate colour: dark Liassic. 9. Black: Exceedingly brittle, appear to be from dark clays, perhaps with addition of a black pigment (and further altered by heat). We consider that they were not so much baked as sundried. The harder ones were `smother baked'. 10. Glass: Only one figure at Cirencester contains glass. Not uncommon in Continental mosaics. Ruby glass oxidises to verdigris colour. Above remarks presumably apply also to the 1777 Dyer Street pavement. desc Wheeler: p.140 No evidence for buildings other than timber before C2. p.142: A few frags of PM were found in and near the `triangular' temple.